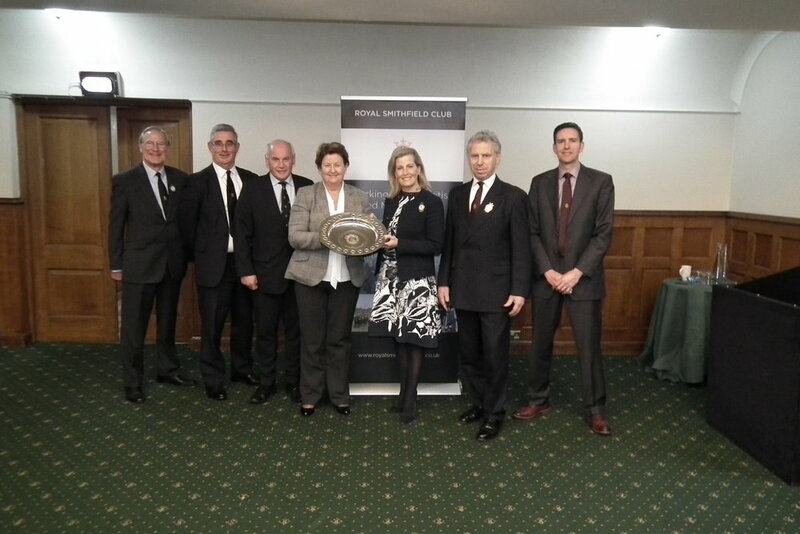 The Royal Smithfield Club’s President HRH The Countess of Wessex has presented former Waitrose & Partners Director Heather Jenkins with the Club’s annual Bicentenary Trophy in recognition of 30 years of outstanding service to the agriculture and meat sectors. As Waitrose & Partners Director for Meat, Poultry, Fish, Frozen Food and Dairy, and Director of Agriculture, Aquaculture and Fisheries Strategy, Heather Jenkins pioneered many industry-leading initiatives during her career as well as working extensively to positively influence Government food and farming policies. Mrs Jenkins supported a policy that ensured Waitrose & Partners pioneered short supply chains, close links with its farmers and the sale of mostly British produced meat. She also insisted on award-winning animal welfare standards across its supply chain including in the production of its Continental meats. All positions it continues to maintain. Her wider support of British farming has led to many claimed UK industry firsts including male dairy calves into the beef and veal supply chain, and a Farming Partnership scheme to help farmers manage costs, drive innovation and research, and reduce their dependence on imported soya beans for animal feed. She also positioned Waitrose to become the first supermarket buyer to sell only free-range eggs. “From lairage design to butchery standards, factory design, improved animal welfare and industry-leading relationships with farmers, fishermen, and other suppliers Heather has been involved,” Mr Bedell said. 1. The Royal Smithfield Club Bicentenary Trophy celebrates the bicentenary of the founding of the Smithfield Club in 1798. The trophy is awarded each year to a person or organisation deemed to have made a significant contribution to the UK meat industry. Recipients can be from any part of the industry - from livestock producers through education, research, processing to retailing. 2. Heather Jenkins is the 19th recipient of the annual Award which includes presentation of the Club’s Armada Shield. In her first engagement as President of The Royal Smithfield Club, Her Royal Highness attended a red meat industry supply chain forum at the House of Lords, London, hosted by Baroness Byford and organised by the Club. The Forum, held to discuss key industry issues and how to address them, was attended by more than 70 representatives of the livestock and red meat sectors including key lobbying organisations, levy boards, Red Tractor and Farm Assurance schemes, processors, manufacturers, breed societies, genetics companies, and show societies. The event was the first of a series of initiatives by the Club that heralds a new era in which it will take on a more active and overarching sector role, and one which will go hand-in-hand with the Club’s core focus on promoting best practice in the production of quality livestock for the British meat industry. West Country farmer John Dracup was introduced in his new role of Industry Strategy Director for the Club. Setting the scene at the Forum he said: “Our main aim is to unite the red meat supply chain to ensure a consistent message reaches our customers. Recognising that the industry is going through unprecedented change, combined with substantial challenges that need to be addressed, he said a stronger voice is needed. High among the issues discussed at the Forum was the impact of Brexit on UK livestock and meat industry business including the availability of non-UK labour, certification and control procedures for meat, and support payments to farmers. The range of issues and challenges faced by the UK red meat sector were addressed at the Forum by four keynote speakers: Nick Allen, Director British Meat Processors Association; David Gunner Chief Executive Dovecote Park; David Hall North West Regional Director NFU and Donald Biggar, Club Trustee followed by a summing- up from Neil Parish MP, Chairman of the Environment, Food & Rural Affairs Select Committee. Mr Dracup’s new role will see him working with Richard Saunders who was appointed Secretary of the Club in succession to Geoffrey Burgess last summer. Mr Burgess has now taken on the role of Club Deputy President. ﻿With the support of Kepak-McIntosh Donald, the Royal Smithfield Club Beef Ribs & Saddle of Lamb competitions, held for the first time within LiveScot, the Scottish National Fatstock Club’s winter primestock event at Lanark on Saturday 24 November 2018, saw a strong entry of 12 ribs and 14 saddles forward. Taking home the Beef Rib championship and with it the Royal Smithfield Club Perpetual Trophy were Matthew & Heather Currie of Skewbridge, Mouswald, Dumfries with their purebred Aberdeen Angus entry, a heifer weighing in at 345.8kg deadweight and grading U4L. Judge Neil Ewing, a wholesaler butcher trading at J Finlay & Co, Wishaw described the winning entry as having “very good conformation, fat cover and eye muscle.” The Curries run a 40-cow pedigree herd of Aberdeen- Angus. Standing reserve was another Angus entry, this time in the shape of a 315kg crossbred grading R4L from B & L Grubb, Mount Pleasant, Ardallie. In third spot were John Spence & Sons, Roberthill, Lockerbie with Blue-cross heifer at 338.2kg U+3. James Frame, Blairston Mains Farm, Riverside Lodge, Alloway, Ayr won the Saddle of Lamb competition together with the Royal Smithfield Club Perpetual Challenge Cup for his Beltex-sired lamb out of a Texel-cross ewe weighing 21.3kg deadweight. Commenting, the Judge said: “This is exactly what a butcher is looking for in terms of a good retail saddle with good conformation and eye muscle.” In second place was Robert Laird, Cambwell Farm, Biggar with third going to Andrew Dunlop, Corstane Farm, Broughton. 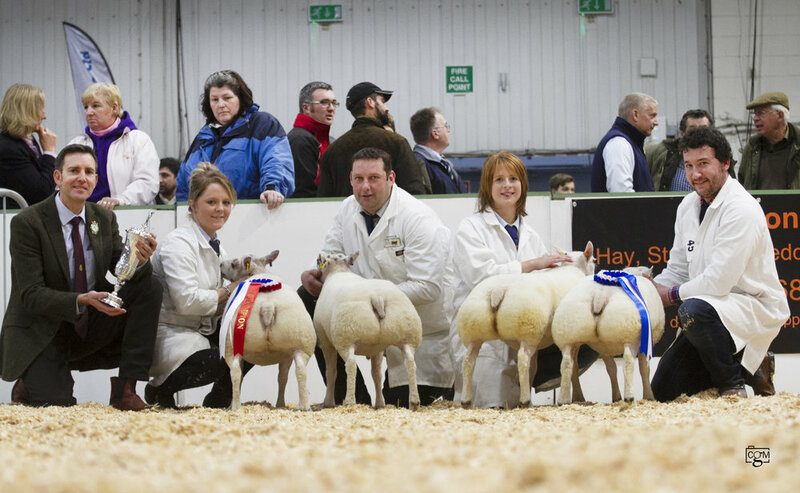 In the heavy lamb class for carcases over 23kg, it was a one-two for R & M Struthers, Collielaw Farm, Carluke with two Texel-Beltex sired lambs with a liveweight of 45 & 44kg which killed out respectively at an excellent 25 and 24.6kgs. Third spot went to J & H Clark, North Garnour Farm, Lesmahagow. The Club is grateful to Alan McNaughton, Site Director at Kepak-McIntosh Donald and to Club President Neil Gourlay for presenting the prizes. Thank you also to all the exhibitors for putting entries forward, to Margaret Gray and all the team at LiveScot, to Royal Smithfield Club Steward Hugh Black of Hugh Black & Sons Butchers and to Judge Neil Ewing for all their hard work in making the event such a success. The Royal Smithfield Club Beef Ribs & Saddle of Lamb competitions, sponsored by Kepak St Merryn and held at the Staffordshire County Showground 17-18 November 2018, witnessed a remarkable double win for Messrs Wynne & Coates who teamed up to secure both awards under Judge Andrew Brown, Ashbourne. This same winning combination teamed up again to produce the Champion Saddle of Lamb, a 23kg U-3 lamb out of a Texel ewe and sired by a Texel x Beltex ram. Reserve went to M & A Hadfield & Sons, Derbys. The Reserve Rib from Messrs Edge was a 350kg 18-month-old Limousin-cross. The Royal Smithfield RABI Single Butchers Lamb, a special class to benefit the Royal Agricultural Benevolent Institution, was won by Robert Garth & Sarah Priestley, Lancs, with their Beltex-cross entry, the second year running that the couple had taken home the RSC Perpetual RABI Trophy. The Royal Smithfield Club extends its thanks to Leighton Jones & Chris Staines of Kepak St Merryn, Judge Andrew Brown, to all exhibitors and all the hard-working team from the Staffordshire & Birmingham Agricultural Society. A well-attended Agrifest South West organised by the National Beef Association and held at Westpoint, Exeter, on 7 November 2018 saw the Royal Smithfield Club’s competitions take centre stage at the event. With the support of sponsor Kepak St Merryn, the Club held its noted Beef Ribs and Saddle of Lamb competitions under Judge and butcher Malcolm Pyne of Pynes of Somerset based at Sedgemoor. Winning the Beef Ribs section were George & Pauline Warne, Emmett Farm, Umberleigh, Devon with a British Blue-cross dairy-bred heifer aged 26m18d with a carcase weight of 371kg grading R4L. Standing Reserve was Sidney Foss with an Aberdeen Angus-cross steer weighing in at 356kg aged 27m22d grading -U4L. Champion Saddle of Lamb went to L Gillbard & Son, Hele Barton, Black Dog, Crediton, Devon with a Texel-cross wether out of a Cheviot-bred Mule purchased from Longtown, Cumbria. With a carcase weight of 19.9kg, this one graded E3L. Second were AW Selley & Son, East Welland Farm, South Molton with a Poll Dorset Mule sired by a Charollais-Texel tup. This wether graded E3L with a carcase weight of 21kg. In the live classes, winning the Primestock Cattle Championship and with it the Royal Cornwall Agricultural Association perpetual trophy presented by the Royal Smithfield Club was an August 2017-born Limousin-sired heifer from Messrs JEL & CS Morgan & Jones, Llysnewydd, Cilycwm, Llandovery. Presenting the trophy was Robert Sloman, Hon Treasurer of the Royal Cornwall Agricultural Association. Reserve was another Lim-sired heifer this time from Messrs P & L Calcraft, Honiton. Taking home the Royal Smithfield Club trophy under Judge Chris Wright, Boston for the Best Pair of Lambs was the Beltex duo from Robert Garth & Sarah Priestley, Bentham, Lancs who successfully defended their 2017 crown. Reserve was another pair of Beltex from R Dafydd Lewis, Carms. Grateful thanks are extended to the NBA organising committee and to Kepak St Merryn for their generous support. Countryside Live hosted three Royal Smithfield Club competitions at the Great Yorkshire Showground, Harrogate 20-21 October 2018. Under Judge Ben Turnbull, Head Butcher at Fodder, the Yorkshire Agricultural Society’s Farm Shop, the Saddle of Lamb Championship went to Mr J Collier, Keighley, Yorks with a Beltex x Texel gimmer with a carcase weight of 17.9kg. The Judge praised its good eye muscle and level of fat cover. 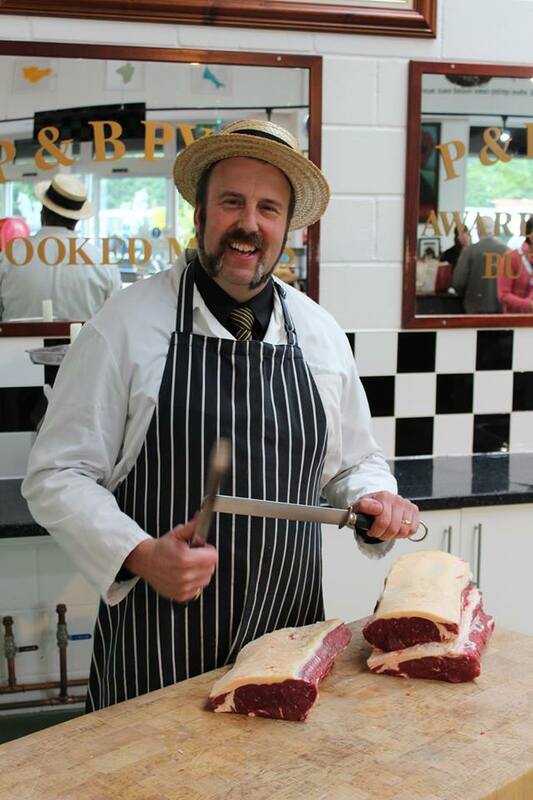 Taking first prize in the Ribs of Beef class was Mr M Read, Horncastle, Lincs with a purebred Lincoln Red. Coming in with a carcase weight of 301.6kg, this April 2017-born heifer had ‘a perfect rib, great eye muscle with the ideal amount of fat for the shop' according to the Judge. Winning the Wagyu Ribs category was Mr A Knowles of Trenchmore Wagyu, West Sussex with a Wagyu x Sussex steer born August 2016 and a deadweight of 356.8kg with the Judge commenting that it had very good marbling without being over fat. Supporting the Smithfield stand over the two days were Club Secretary Richard Saunders, Club Administrator Jo Short, butcher and tutor at Bishop Burton Agricultural College, Paul Nicholson, together with Connor Gillan, an apprentice butcher from Bishop Burton. Grateful thanks are extended to sponsors Delta Wagyu & the Wagyu Breeders Association together with the Yorkshire Agricultural Society. The Royal Smithfield Club Saddle of Lamb & Beef Ribs competitions are being held within LiveScot at Lanark on Saturday 24th November 2018. Grateful thanks are extended to Kepak McIntosh Donald for their generous support. See www.fatstockclub.co.uk. Schedules and entry forms available by clicking HERE. Please note closing date 2 November. Further info from Secretary Margaret Gray secretary@fatstockclub.co.uk. Wednesday 7th November 2018 sees the return to Agrifest South West of the Royal Smithfield Club Beef Ribs and Saddle of Lamb competitions kindly supported by Kepak St Merryn. The event is being held at Westpoint, Clyst st Mary, Exeter, EX5 1DJ under the auspices of the National Beef Association. Entries can be made via the website www.agrifestsouthwest.co.uk or by clicking the following link HERE. Please note entries close 16th October. 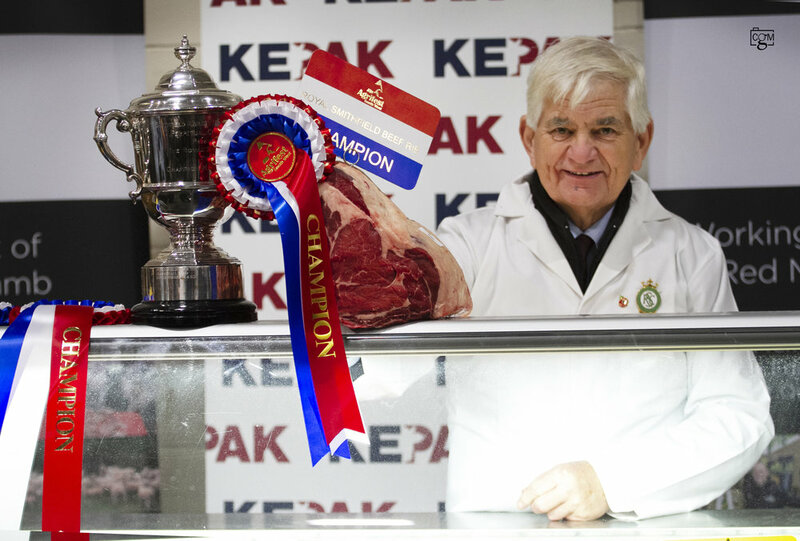 The Royal Smithfield Club has announced that Kepak will sponsor three of its Beef Ribs & Saddle of Lamb Competitions being held within this winter’s series of primestock shows, namely Agrifest South West 7th November, English Winter Fair 17th-18th November and LiveScot 24th November. Kepak, the Irish-based meat company which acquired 2 Sisters Red Meat during the summer, operates from four key production sites in the UK: McIntosh Donald, Portlethen, Scotland; and three St Merryn sites: Merthyr, Glamorgan, Wales, and Bodmin and Victoria in Cornwall, England. The Club runs a series of demonstrations and competitions at the main fatstock events to educate and inform the public as well as promote best practice in the industry through the whole supply chain. In 2018, these are to include Agrifest South West at Exeter, English Winter Fair at Stafford, LiveScot at Lanark as well as Countryside Live at Harrogate. Schedules and Entry Forms are now available for the Countryside Live Royal Smithfield Club Beef Ribs & Saddle of Lamb competitions to be held at the Great Yorkshire Showground, Harrogate, N Yorks Saturday 20th to Sunday 21st October 2018. The Ribs competition will again feature classes for Native, Continental and Wagyu-sired cattle. For schedules and entry forms for Native & Continental Ribs click HERE, for Wagyu click HERE, for Lamb click HERE. Please note the closing date for entries is 5th October. Winning the Pig section and then the overall points trophy for the event was the Massey Divas team of Grace Bretherton, Charlotte and Eve Ashcroft, photographed alongside Royal Smithfield Club Chairman William Bedell, RSC's Phil Henshaw and Event Chairman Neil Lloyd. 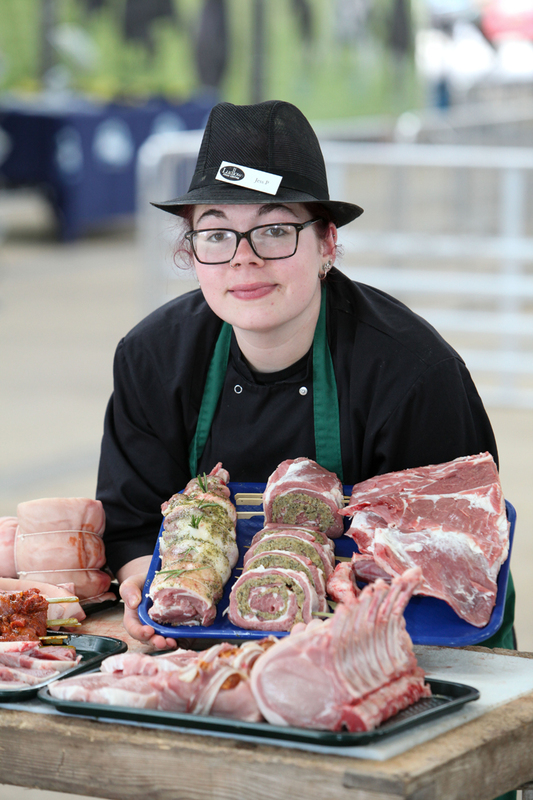 This year’s National Young Stars event once again saw young agricultural enthusiasts descend on the Royal Three Counties Showground 21-22 August 2018 for two days of competition in various cattle, sheep, pigs and butchery sections including stockjudging, show preparation, ring craft, public speaking, marketing and publicity and industry knowledge competitions, making this event a stand-alone national platform for agriculture’s next generation. Jess Pugh of the Shropshire-based Ludlow Food Centre returned to the Malvern Showground to retain her Royal Smithfield Club-sponsored butchery title from last year. Jess impressed the AHDB judge Martin Eccles and independent butcher Viv Harvey with her butchery knowledge, thorough work process and imaginative presentation skills. In second place was Jake Edwards sponsored by Althams Butchers with third spot going to Ben Greenfield who was sponsored by Greenfield Lamb. Coming through on top in the beef section winning a Norbreck Genetics and Semex clothing and genetics package was the Black as Night team, represented by Ellie Westaway, Glos; Robyn Westcott, Somerset and Kian Frain, Cornwall, who came with a pair of Aberdeen-Angus heifers. These three competitors excelled in areas of stockjudging and clipping and presentation with the judge for the latter, Wendy Morgan saying that all three individuals excelled at team work and were very clear in their approach and style of presenting their animals. Runners-up in the beef section was the Lim-It team of Emma Rathbone, Stoke on Trent; Brooks Carey, Somerset and Elliw Roberts, Anglesey, representing the British Limousin Cattle Society, while the Canadian exchange team came third. In a change to previous years, the judges and stewards selected three individuals to represent the UK in Canada at the Royal Winter Fair, Toronto, in November. Joining beef team winner Ellie Westaway in Canada will be Michael Dumbreck and Tom Brown on the Northern Boys Charolais team. A new competition for this year saw a dual purpose/beef untrimmed section added to proceedings with the Delightful Dexter team flying the flag for their sponsors The Wise Cow and Rayner Farms. This team consisted of Millie Bennet and Evie Welch, Somerset along with Oliver Spence, Swindon, all of which will receive a team cash prize of £300. Runners up here was the Sussex Martlets, consisting of Grace Twyman, Kent along with Sarah Dykes and Freddie Hutchings, Sussex. Winning a trip to The European Show in Libramont having shone in the dairy section was the Roan Rangers Dairy Shorthorn team, sponsored by the Farmers Guardian. Bob Crank, Cheshire, Florence Mannerings, Kent and Hannah Morgan, Shropshire, took the top spot ahead of the Just Jerseys team of Emily Davis, Jess Ravenhill and Jess Tapp from Devon. In the sheep lines competition was split this year in to untrimmed and trimmed sections with 10 teams competing across the board. Coming through on top in the trimmed section and winning their set of Heineger sheep clippers were the Kerry Hill Young Breeders of Chris Adamson and Henry Scott from Somerset and Tolly Ridge, Sussex. These three individuals impressed the judges with a fantastic promotional stand which won the overall promotional stand award of the show and high standard of presentation throughout all areas of the competition. Commenting on their win, judge Brian Davies said: “These three young men are a credit to their breed and impressed us with their work ethic, teamwork ethic and dedication to the competition.” Runners up in the trimmed section were the Hampshire Down Hot Shots of Ellie Alvis, Stephen Short and Samantha Todd. Meanwhile, in the untrimmed section, the top spot and recipients of a £300 cash prize was the Somerset-based Dorset Down Dazzlers team with Alex and Aaron Hext and Harry Stamp. This team gained strong points in all sections with nine-year old Harry Stamp particularly impressing the judged with his strong work ethic over the two days. Runners-up in this section was the Blue Texel Sheep Society’s True Blues team, consisting of Harvey Heath, Derbyshire, Ted Lloyd, Herefordshire and Jack Bodily, Monmouthshire. 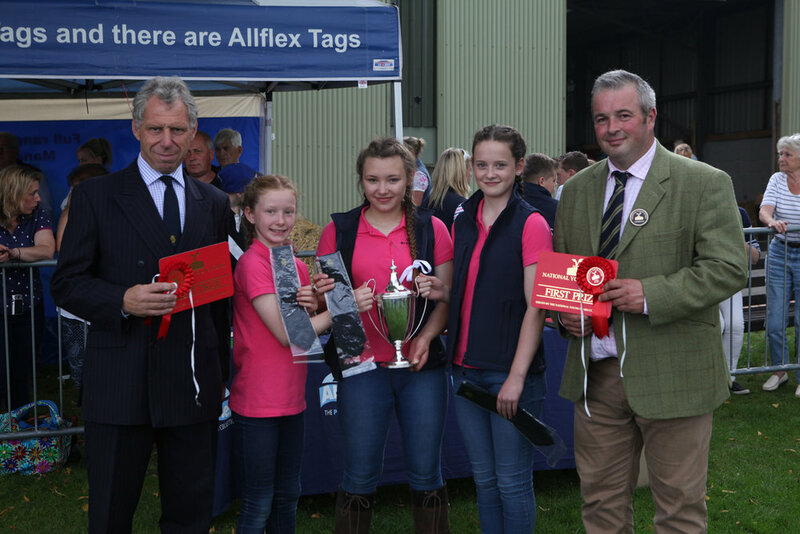 Runners-up in the pig section was the Spotty Trotters team of Ella Kirtley, Sarah Whitely and Charlotte Gill, Yorkshire, with their Gloucester Old Spot team. 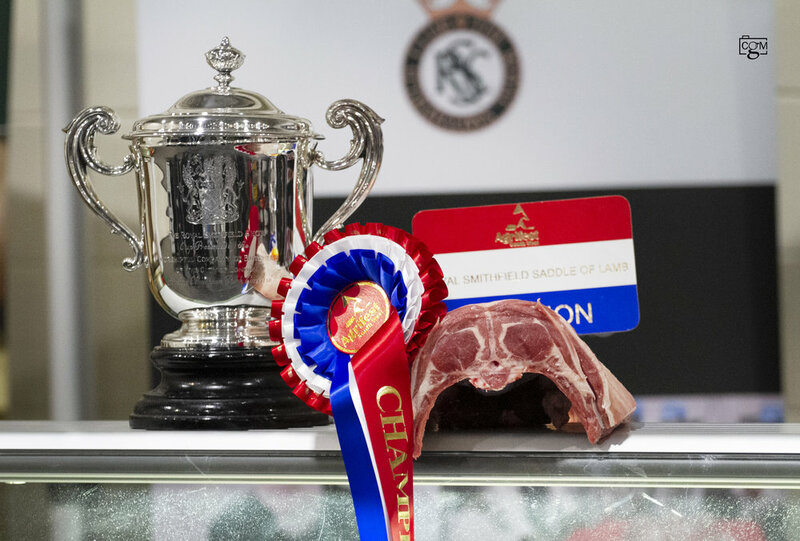 Created to celebrate the bicentenary of the founding of the Smithfield Club in 1798, the trophy is awarded each year to a person or organisation deemed to have made a significant contribution to the UK meat industry. Recipients can be from any part of the industry - from livestock producers through education, research, processing to retailing. Nominations are received each year by the Smithfield Club, from a wide range of people. The thirty to forty nominees are considered by a panel made up of representatives from across all sectors who meet to create their shortlist from which they choose the winner for the year. Please click HERE for a Nomination Form noting the closing date of Monday 13th August 2018. The Royal Smithfield Club is delighted to once again be supporting the Butchery Challenge as part of the National Young Stars event to be held at the Three Counties Showground, Malvern, 21-22 August 2018. This is a competitive challenge sedigned to further the skills of young butchers and to enable them to display their abilities and skills in a range of butchery, cutting and presentation techniques. Please click here for an Entry Form noting that entries close Monday 6th August. For further information, please see www.nationalyoungstars.com. Around 50 Members and guests attended the annual President’s Weekend hosted by Neil & Mary Gourlay, Auchencheyne, Moniaive, Thornhill, Dumfries. Day One saw a tour of the home farm including the suckler cows, sheep enterprise and pedigree herd of Luings followed by a visit to the wind, hydro and CHP (wood) power generation projects. Rugby hero Mike Tindall MBE was one of the star guests at Countryside Live, Harrogate 21-22 October 2017 where he was a special judge in one of the competitive classes. The Club’s final presentation in 2017 was for the Housewife’s Choice Champion at the Ulster Premier Christmas Show, a competition aimed at commercial weight entries to highlight the demand for lighter stock. Early November saw the Club running a beef ribs demonstration at AgriFest South West at the Devon County Showground. This year’s winner, Robert Forster - journalist and founding Director of the National Beef Association - was taken by complete surprise when he was announced as the 2017 Trophy winner at the Association of Independent Meat Suppliers annual dinner and conference in late October.